Happy Monday everyone! Was your weekend filled with happy memories? 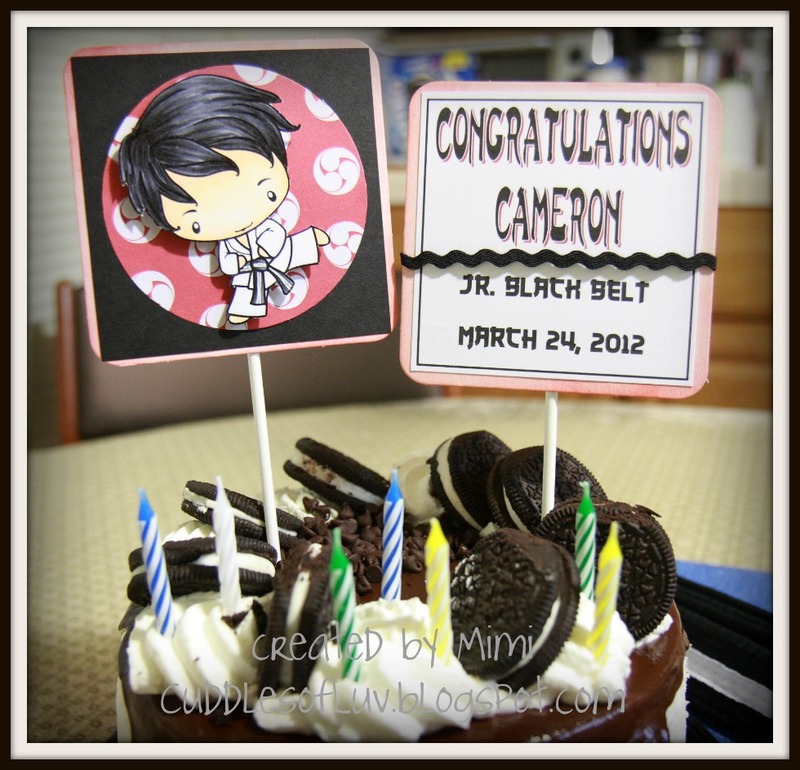 On Saturday, our family certainly had two big events to celebrate... my son passed his karate test for his Jr. Black Belt! and my wonderful hubby's big 50th birthday! We had a big celebration at home with family and friends, and just ate all night! I always forget to take pictures of the food, but we had prime rib, cioppino, bun rieu (a vietnamese noodle soup), with plenty of sides and desserts! A mini buffet right at home! Very simple layout. Karate Ian colored in his Sensei gi's colors, red cardstock stamped with "thanks" as the background, and "Arigato" cutout is from Jenny! Cameron started this journey when he was in kindergarten, and throughout all these years (he's only 11), he continued to climb each step and grow along the way, to finally reach this amazing achievement! 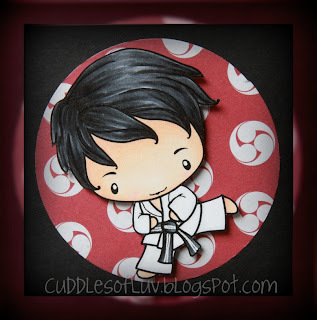 His Sensei says he is the youngest of the dojo to obtain a Jr. Black Belt. We are so very proud of him! I decorated a couple of chipboards with the same image, colored it to represent his gi and new belt, and a congrats sign for his favorite cake... OREOS!!! Let me just say that this past month, he trained so hard in order to pass this test, I was so stressed out just watching him train. When Saturday morning came, I think I was more nervous than he was! The testing didn't start until 2pm, so the wait was just agonizing! I'm so glad that he performed so well, and I can see the determination in his face during the whole TWO HOURS! Okay... that's enough for me today. I will share the other celebration we had on Saturday night on another post! Head over to Lollipop Crafts to see more of the DT wonderful inspiration, and hope you can join the fun! Love the image... Fantastic creation Mimi! Great JOB! Big congrats to your son and Happy belated birthday to your hubby..
BIG CONGRATS to your son. I can just imagine how proud you and your hubby must be. 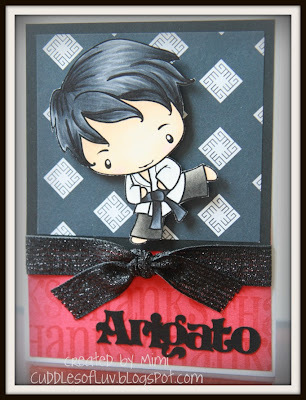 This is a perfect card for him and what a clever idea to use black ribbon to represent his gi. Happy B/D to your hubby too for making the big FIVE O. BTW, when you get a chance, please hop over to my blog as I have an award for you. congratulations to your son's achievement and happy birthday to your husband! so glad to hear that you had a great time celebrating. 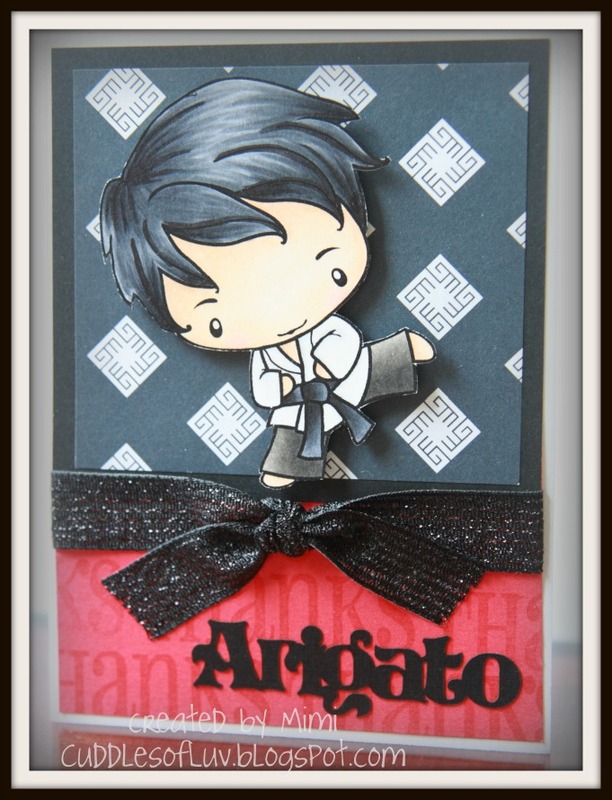 fabulous masculine card and love the cake topper! super projects, Mimi! Super cute card in honor of your son! And congrats on his achievement! How exciting! Yipee! Big congratulations to Cameron! He must still be on cloud nine after passing his test! Awesome creations Mimi - as always! Happy Birthday to your hubster too! xoxo! Woo hoo!!! What an awesome accomplishment for your son! I know you and your DH are probably proud as can be. The cards and fantastik and the cake toppers are so awesome!! I really love this set you created. Pretty cool! !